A warrant has been issued for the South Jersey man who stole a plane and took it for a joyride along the shore on Sunday night, 6/24. The man has been identified as 50-year-old Jimmy Dahlen Jr. He works as a mechanic at Paramount Air Services in Middle Township. He is the stepson of the owner of the business which flies banners and advertisements along the shore. 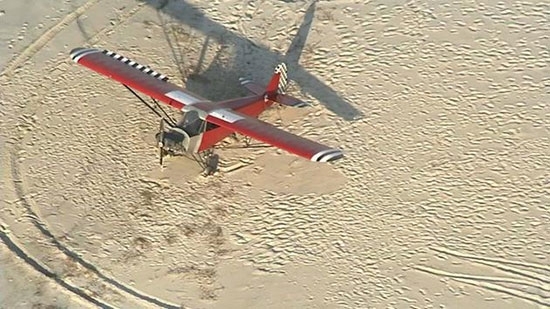 Dahlen Jr. is only a student pilot and was flying erratically over the beach before landing the Piper PA12 on the Coast Guard Training Center's beach. He ran out of the plane and remains at large. No word on what charges he faces. Philadelphia Police have interviewed a person of interest in connection to the hit-and-run that killed a 5-year-old boy in West Philadelphia on Friday, 6/22. No arrests have been made and no charges filed. Xavier Moy was struck and killed around 4 p.m. Friday near 50th and Irving Streets. Police put out images of a car suspected in the incident. That car was turned in on Sunday. Investigators are determining if that is the car from the hit-and-run. The person-of-interest questioned may be the female owner of the car. The Philadelphia FOP is offering a $5,000 reward for any information that leads to an arrest in the case. Fire Marshals are investigating another fire as suspicious at a townhome complex under construction in Camden County, NJ. This fire started just before 3 a.m. on Tuesday at the Iron Gate Townhomes in Sicklerville. It was on the outside of one of the units under construction. This is the 4th fire dating back to September 2017 that officials have ruled arson. So far no one has been arrested. The developers installed security cameras after the first fire to hopefully catch the person(s) involved.